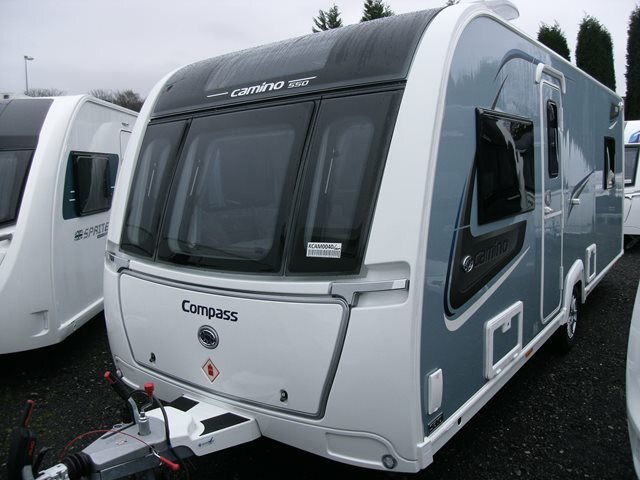 Our new Compass Camino 550 is shown below, for more information please contact us. We are delighted to bring the Compass Camino to the West Midlands! The 2019 Camino has a high level of specification including Alde wet central heating, AL-KO wheel locks, external BBQ & 230v points, Aquaclean & Safefront PetFriendly upholstery, 40L on board water tank and stargazer rooflight. Add to this the Tracker Thatcham Cat 7 approved tracker with 1 year subscription, Aquasource water line and aluminium one piece sides in 'Champagne Gold' and you can truly get away in complete luxury. This four berth 550 features parallel bench seats to the front, mid kitchen, split mid wash room and a rear island bed. For any further information please contact us on 01384 413336 and ask for a member of the sales team.